Mr. Holland's Opus is a 1995 drama film in which Richard Dreyfuss plays Glenn Holland, a musician and composer who takes a teaching job to pay the rent while trying to compose one memorable piece of music to make him famous. The film features an orchestral score by Michael Kamen and many pieces of classical music. Kamen also wrote An American Symphony, the work Mr. Holland is shown working on throughout the movie. The movie was written by Patrick Sheane Duncan (for which he received a Golden Globe nomination) and directed by Stephen Herek. Dreyfuss was nominated for an Oscar and a Golden Globe. It also stars Glenne Headly, Jay Thomas, Olympia Dukakis, William H. Macy, Alicia Witt, Terrence Howard, Jean Louisa Kelly, and Joanna Gleason. Almost Famous is a 2000 film written and directed by Cameron Crowe and released in 2000. It tells a fictional story of a teenage journalist initially writing for CREEM magazine and then later for Rolling Stone covering the rock band Stillwater, and his efforts to get his first cover story published. The film is semi-autobiographical, as Crowe himself was a teenage writer for Rolling Stone. Despite very good reviews, the film was not a box-office success. The film received four Oscar nominations, one of which led to an award to Crowe for his screenplay. It was also awarded the 2001 Grammy Award for Best Compilation Soundtrack Album for a Motion Picture, Television or Other Visual Media. Roger Ebert hailed it as the best movie of the year. The film itself is based on Crowe's experiences on tour with rock band The Allman Brothers Band, and somewhat about his tour with Led Zeppelin in the early 1970s. It is also based on him touring with Lynyrd Skynyrd. He even said that Ronnie Van Zant was a big basis on the movie. In the Rolling Stone article, he talks about how he lost his virginity, fell in love, and met his heroes, experiences that the main character William has in the movie. 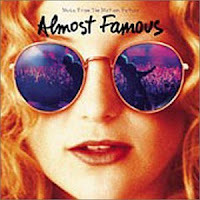 The tagline for Almost Famous is "Experience It. Enjoy It. Just Don't Fall For It." Read the vocabulary given in class and write about them. Describe where they were said, who said them, why said them and, if it proceeds, give the meaning of them. The death of someone is itself painful and sad. But a funeral is surrounded by many situations created not only by the friends and the friends' friends' friends of the family but also by the members of the family too. This exercise is not done to satirize or ridiculize the funeral ceremony, but to demonstrate that every sad situation in our lives have always another face: a funny one. Below, there is a list of what to do and what not to do in a funeral. 1. If you have assisted to a funeral. Have you seen any of the actions described below? 2. If you have never assisted to a funeral. How do you think you would feel assisting to one? 3. According to the "Coupling" episode, Do you believe in the theory of 'giggle-loop' explained in the episode? Have you ever passed through it any time? Don't attend funerals of people you don't know. Don't try to outdo the family's grief. Don't use the occasion to "schmooze". Don't ask for "just a peek-a-doodle" if it is a closed casket. Don't rate the funeral with a 1-10 rating scale in front of the family. Don't race the hearse to the cemetery. Do offer your help, but don't charge for it. Don't make statements like "something seems fishy to me" or "I hope they did an autopsy." Don't remark that the deceased looks "way better than they ever did"
Don't sit in the front row of the church and lean over the seat to wave at everyone you know coming in. Do realize that the grieving family probably knows the deceased more than you do: especially if it is your neighbour or your friend's aunt. Don't approach the widow/widower and ask for the fifty dollars the deceased owed you. Don't make an offer to the widow/widower on the deceased clothes. Don't try to make the grieving family feel better by handing them a typewritten list of the deceased's faults. Don't climb on headstones to get a better view. Don't do impressions of the deceased. Don't ask about the "eats" the minute you arrive at the funeral home. Don't ask if there's any booze. Don't use the word "rooked" if a discussion of funeral expenses arises. Don't ask the widow/widower on a date at the funeral home. Don't tell everyone how much your flower arrangement cost and offer to show them the bill if they don't believe you. Don't remove anything from the coffin as a memento. Don't tell the grieving family "it could be worse" and then go into a long rambling story about the passing of your little dog Blue. Don't tell the relatives that this is the smallest funeral you've ever seen. Don't use a fake name like "I.P. Nightly" in the guestbook. Don't offer to make a beer-run. If you want listen again the national final debate in English 2006. Then, answer the following requests. 1. Write at least 2 arguments given for the proposition team, and explain them in your own words. 2. Write at least 2 arguments given for the opposition team, and explain them in your own words. 3. According to you... What team should have won the competition? 4. In which team you would be and why? tell me just one argument. Boys and girls... The new assignment for this week (from August 6th to August 18th) is below the article about COOKING.